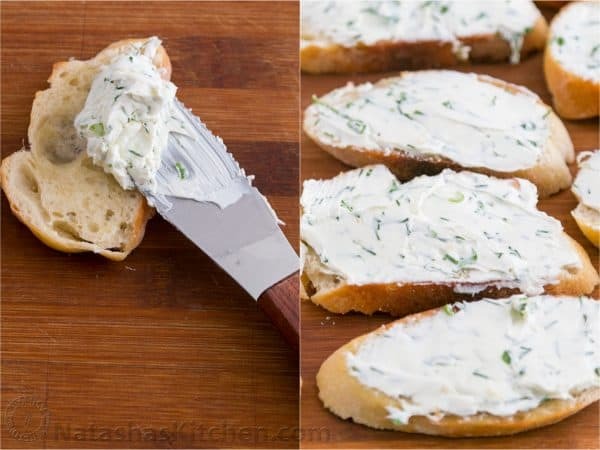 The herbed cream cheese infused with a little garlic makes for an amazing spread for crostini. Top with avocado and you have a very impressive little tea sandwich. 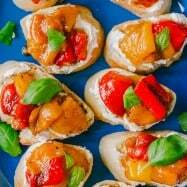 My cousin Lena shared a photo of these (her favorite canapés) on Instagram and I couldn’t resist trying out the recipe. You know Lena from other recipes on this blog such as her Meatballs in a cream sauce (Tefteli), or the ridiculously amazing Creamy Cauliflower soup with shrimp, and not to mention her Chebureki recipe that you all rave about and have pinned over 500 times; no big deal ;). Yeah it’s the same Lena. 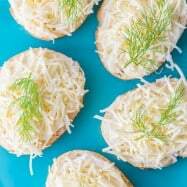 In leu of cream cheese, you can also use Boursin cheese to kick the flavor up a notch. If you’re using cream cheese like we did; don’t forget the garlic (I am telling you this because we forgot the garlic the first time :-O). I like love garlic. The trick is to be a discreet garlic lover and never chomp down on garlic before social functions; you will lose friends. 1. 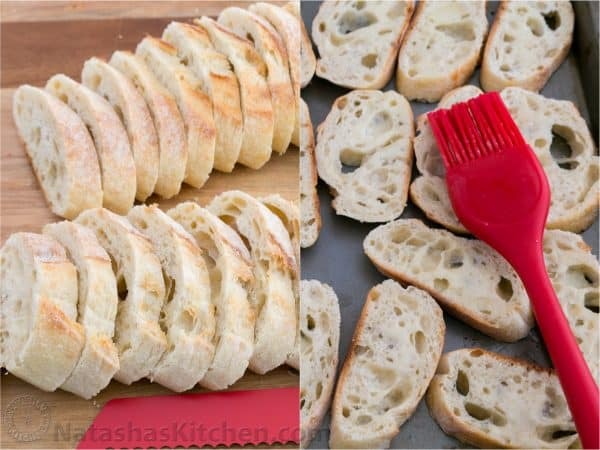 Slice the bread into 1/3-inch slices (cut on the diagonal if it’s a very small baguette to get bigger slices). 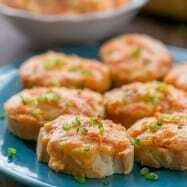 Place them on a baking sheet and lightly brush both sides with melted butter. 2. Bake 5 minutes, or until they are just starting to golden. Do the ”poke” test with your finger to make sure they are still soft in the center. Let these cool to room temperature. It’s ok if they are still a little warm when spreading. Cut your avocado in half, remove the pit, spoon the avocado flesh out of the shell and cut avocado into slices. Finely dice both onions and chop 1/4 cup of fresh dill. 3. 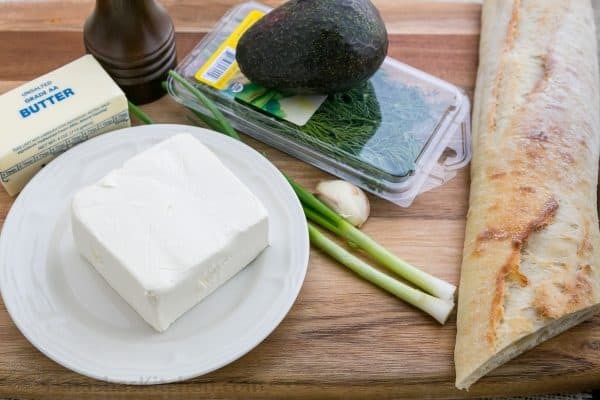 Use a fork to mash together 8 oz cream cheese, 1/4 cup chopped dill (fresh or frozen), chopped green onion and your pressed garlic clove (I’m way too lazy to finely chop garlic. I love my OXO Garlic Press ). 4. 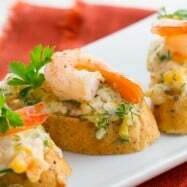 Spread enough herbed cream cheese over each canapé to generously cover the top. 5. 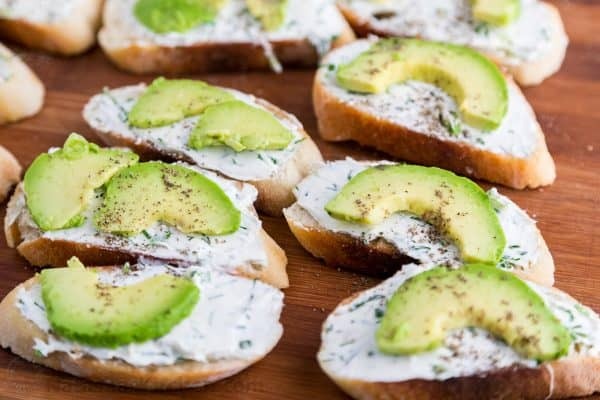 Top canapés with avocado slices and squeeze a few drops of lemon juice over each avocado slice (to keep from browning), then sprinkle with freshly ground black pepper. 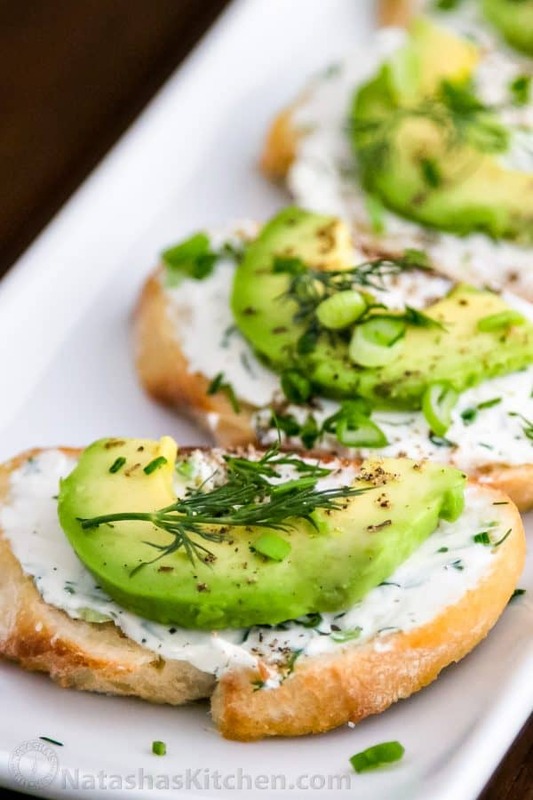 Garnish with dill and green onion and you’re done! It’s best fresh but tastes great even after refrigeration. 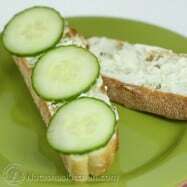 Slice the bread into 1/3-inch slices (cut on the diagonal if it's a very small baguette to get bigger slices). Place them on a baking sheet and lightly brush both sides with melted butter. Bake 5 minutes, or until they are just starting to golden. Let these cool to room temperature. 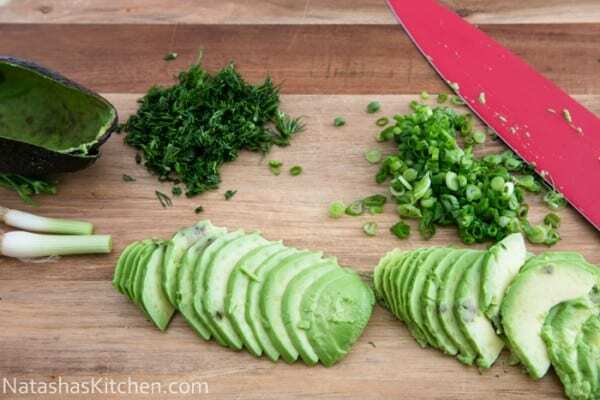 Toppings: Cut your avocado in half, remove the pit, spoon the avocado flesh out of the shell and cut avocado into slices. Finely chop both green onions and 1/4 cup of fresh dill. 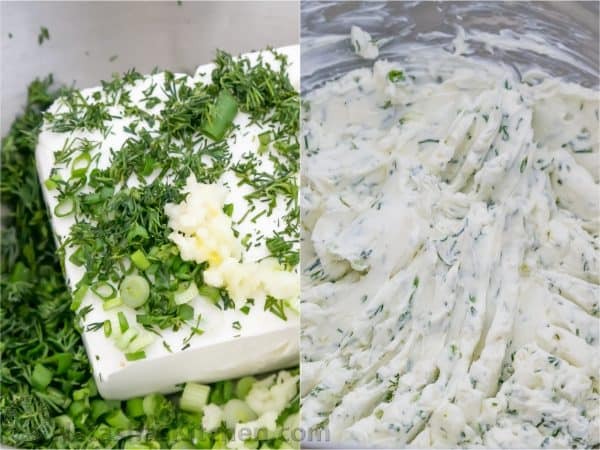 Use a fork to mash together 8 oz cream cheese, 1/4 cup chopped dill, chopped green onion and your pressed garlic clove. 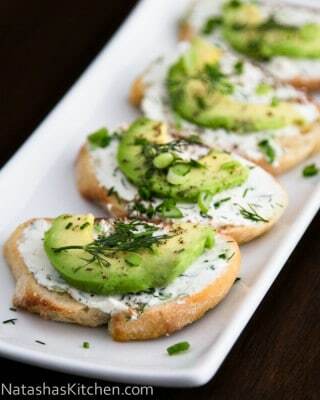 Spread enough herbed cream cheese over each canapé to generously cover the top. 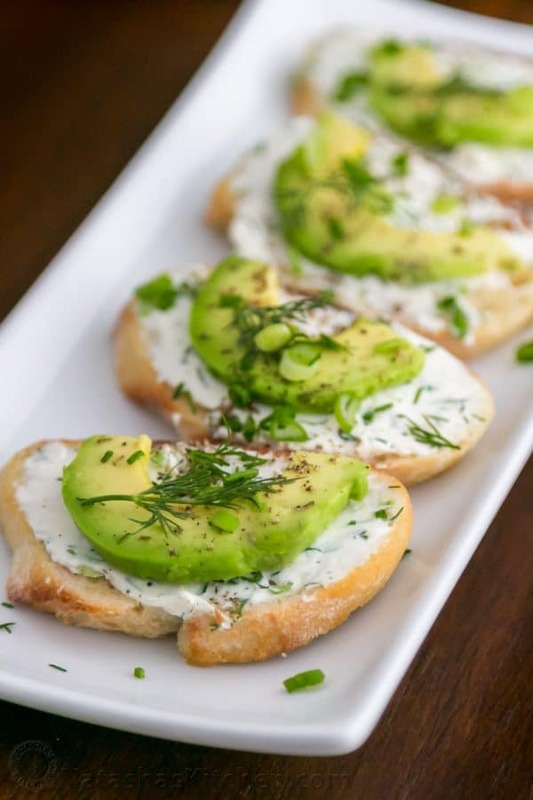 Top canapés with avocado slices and squeeze a couple drops of lemon juice over the avocado slices (this keeps the avocado from browning), then sprinkle with freshly ground black pepper. 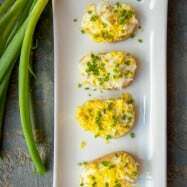 Garnish with dill and green onion and you're done! It's best fresh but tastes great even after refrigeration. Will the avocado turn darker if it will sit a little while on the table?